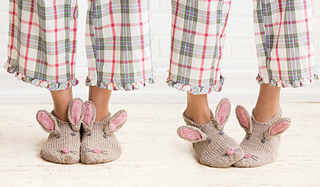 What’s a slipper collection without these floppy-eared classics? They begin at the heel section, which is knit flat in garter stitch, and continue in the round for the stockinette foot. Decreases shape the toe. 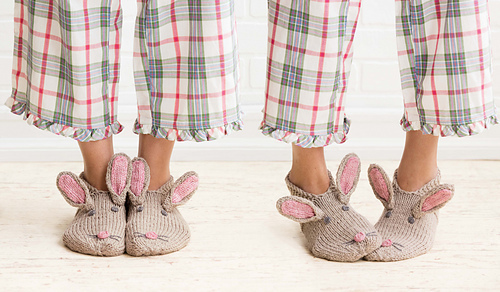 The bunny ears are knit separately and sewn on, while crochet chain stitches form the eyes, nose and whiskers. Colorways used are #1036 Sisal (A), #1025 tea rose (B), #1049 slate (C).